In the summer of 1993, the Midwest was in the midst of a historic flood. The Missouri and Mississippi rivers overflowed and left miles of the Iowa/Missouri/Illinois landscape underwater. That same summer, I travelled to St. Louis with my dad and grandpa for a three game Cardinals series. The water was creeping on to the highway in places. Crews were hauling sandbags up in some spots. I remember getting about halfway between KC and STL and listening to my dad and grandpa discuss whether we should turn around and head home or keep on pressing on against the flood waters. I was only seven, so the memories I have of the trip aren’t terrific. I think the Cardinals played the Mets which (if correct) would make the series July 29, 30 and August 1 late that summer. The Cardinals won the first two and lost the third to Dwight Gooden. Of the memories I have, the one that stands out the most is of Lee Smith. Lee Smith was a large man – 6′ 5″, 220 lbs – with a light beard and nappy hair that stuck out from under his cap dramatically (at least early in his career, but he kept it high and tight after leaving the Cubs). 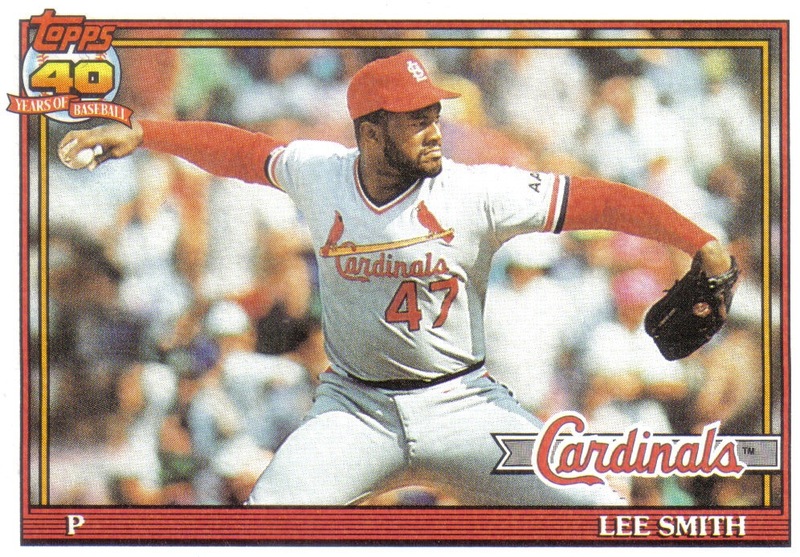 The thick elastic waistbands of the 80s and early 90s certainly did his physique no favors – especially as he reached his mid-30s with the Cardinals. Smith earned the save in both games the Cardinals won that series in ’93. I remember my dad sitting next to me in our seats in the upper deck of old Busch Stadium, nudging me with his elbow and pointing across to the home bullpen as the door opened. He told me to watch how slow Lee Smith walked toward the pitchers mound. Sure enough, as Smith emerged from the bullpen door he showed no sense of urgency as he walked the 300 or so feet to the mound. He just sauntered in taking foreeeeever. I remember finding this absolutely hilarious, but I also remember wondering, “how did my dad know that was going to happen?” It didn’t occur to me that Smith did it every time and my dad had watched him for over 3 years walk out of the bullpen for the Cardinals and 8 years before that with the Cubs (although, the walk was much shorter at Wrigley than Busch.) I figured it out the next night though when the Cardinals called on Smith again. This time, I nudged my grandpa and told him to watch how slow Smith walked in from the bullpen. I’m sure my grandpa was already fully aware of it, but he feigned being astonished anyway. Thanks, Grandpa. Smith was an 7-time All Star and finished his career with the most saves (478) in MLB history (he has since been passed by Trevor Hoffman and Mariano Rivera). He was arguably the most dominant relief pitcher of his era. As the Hall of Fame vote draws near, it’s clear that Lee Smith won’t make it in again this year. The ballot is too jam packed with names and with the 10 player maximum rule, there’s no way he’ll join the likes of Randy Johnson, Pedro Martinez and Craig Biggio. I wouldn’t vote for him myself actually. Last year, Smith got 29.9% of the vote. He will likely drop a bit this year but get the 5% necessary to remain on the ballot. But he’s running out of time. It seems like he may never reach Cooperstown, but let’s be honest, he’s a borderline candidate anyway. But Hall of Famer or not, I sure loved watching the guy pitch. He was a part of my household humor growing up. Any time someone walked too slowly around the house, it’s possible they could be referred to as “Lee Smithing” it. If I played my NES for an extra 10 minutes after be summoned for dinner, my dad would holler down the basement stairs at me: what’s taking so long down there, Lee? A few weeks back, I found the 1991 Topps card in a box of my old baseball cards. It’s essentially worthless – worth a nickel or so, probably – but I found it encased in a plastic protector sleeve. My 7-year old self thought he was a Hall worthy. Anyway. Always liked Lee Smith. He’ll always have a soft spot in my heart thanks to the memories he left three generations of the Cooper family during the flood of 1993. Previous Previous post: Christmas Board Games, 2010-2014. This year’s purchase: Camel Up.